This piece was first published on Dec 12, 2012, in ‘The Small Picture’ in the newspaper edition of Mint. 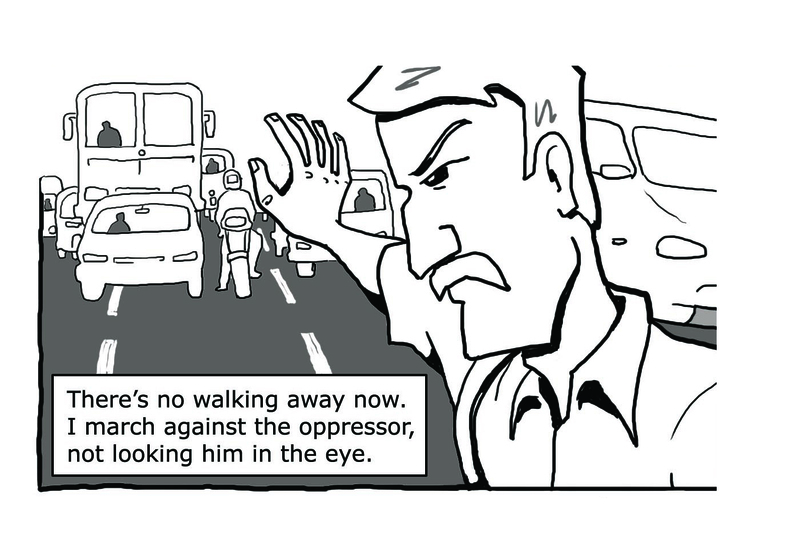 This graphic narrative depicts the plight of a pedestrian through the perspective of a person who has been a pedestrian for years in a typical Indian metropolis. 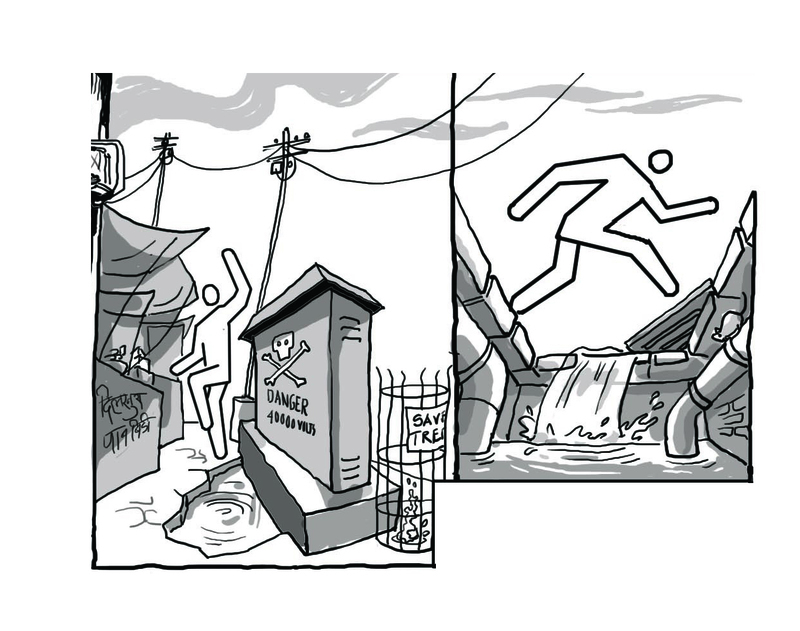 The story depicts his daily struggle to move around in the city on foot, throwing light on some glaring issues of urban pedestrian accessibility. Coupled with recent studies that have shown that road fatalities in India to be at a gruesomely staggering 1.4 million people annually, this becomes a critical issue to be addressed. Pedestrians are the most common victims in any given situation, and account for 10% of all road fatalities. In some Indian cities, this percentage is as high as 40%. It is a common observation, especially in Mumbai, (where I currently live), of how Indian pedestrians typically bunch up against oncoming traffic, and cross roads valiantly in the absence of any essential infrastructure, like signals and zebra crossings (cross-walks). It’s almost a silent and compulsive uprising, a commonplace act of day-to-day survival. Typical peak-hour jams on main-roads meant for exclusive use by vehicles. An exaggeration of how signals only aid traffic and not people, with an array of ‘legalized’ movements of the traffic; the two adversaries being addressed. The zebra crossing barely there, burdened with the walking crowds, while a devilish driver looks on (his grip resembles the Satan’s clutch while an ironically cute soft-toy dangles on the mirror.) 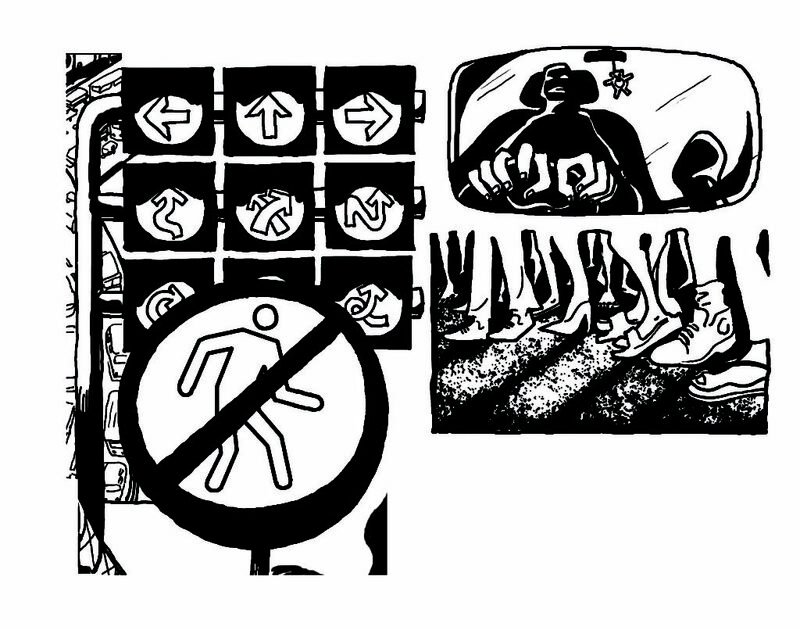 A dominating signage of ‘NO JAY-WALKING’ signifies the overall situation, with the symbolic human figure, portrayed in all other panels, representing the pedestrian. Narrator: Against decades of apathy from those who pave the ‘development’… against the skewed planning priorities that aid and abet today’s oppressors behind wheels. The struggle to claim public space for more than half of the urban population on the move within the city…on foot. Inadequate walking space with crushing effects, the imbalance of allocated space – purely a fault of poorly designed roads, compared to the volumes. 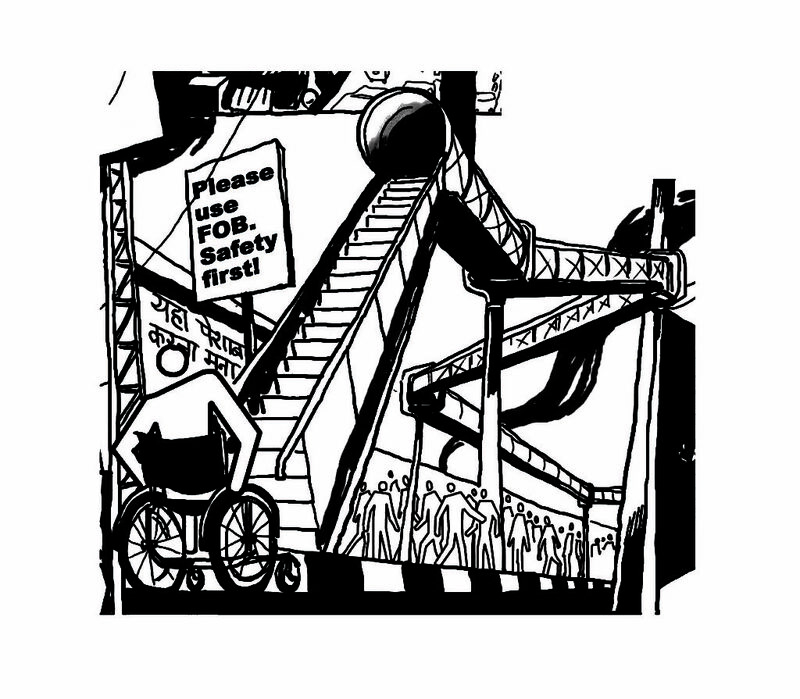 The construction of mega-scale public projects, especially fly-overs, that stretch on for decades leaving pedestrians vulnerable to walking along dangerous sites. 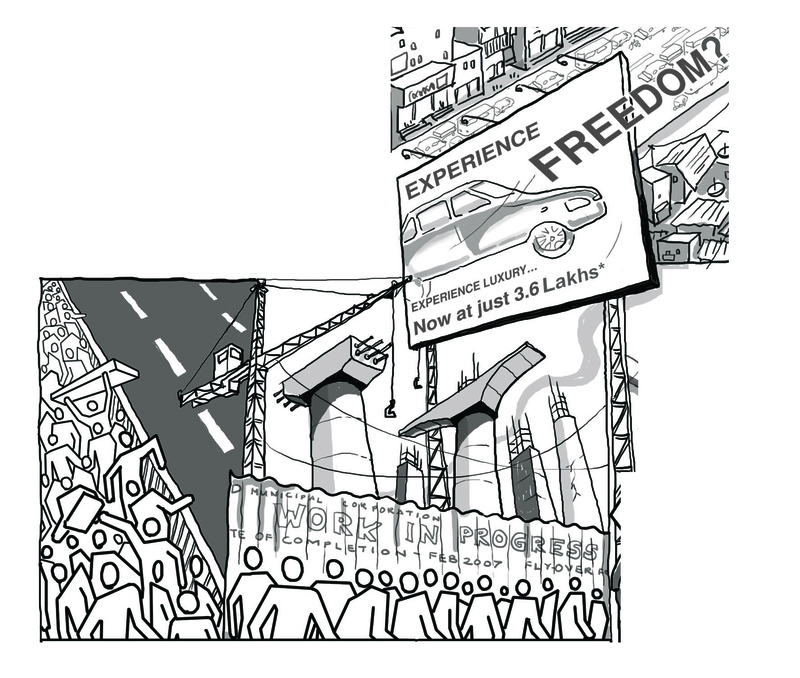 The ubiquitous car-advertisement billboard further mocks the large populace on foot, with its pretentious promotion lines – “Experience Freedom, experience luxury, now at just 3.6 Lakhs*.” Ironically the ‘Freedom (? )’ letters spring out of the billboard and merge over the traffic-jam. ‘Is this the ‘freedom’ that we really aspire for?’ is the implication. Sky-walks move pedestrians away from traffic, however, they are a huge investment, are not used to their optimum value, and are not designed for universal access. Inadequate walking infrastructure that nobody cares to maintain and the resulting threats and obstacles to pedestrians. Narrator: or lays hurdles where there should be none. This visual portrays a zebra crossing, and is the ‘plot point’ of the story. The vertical stripes metaphorically translate also into a ‘cage’ for the enthusiastic joggers while it concludes in showing a fatality on it, with the newspaper proclaiming facts on traffic fatalities. 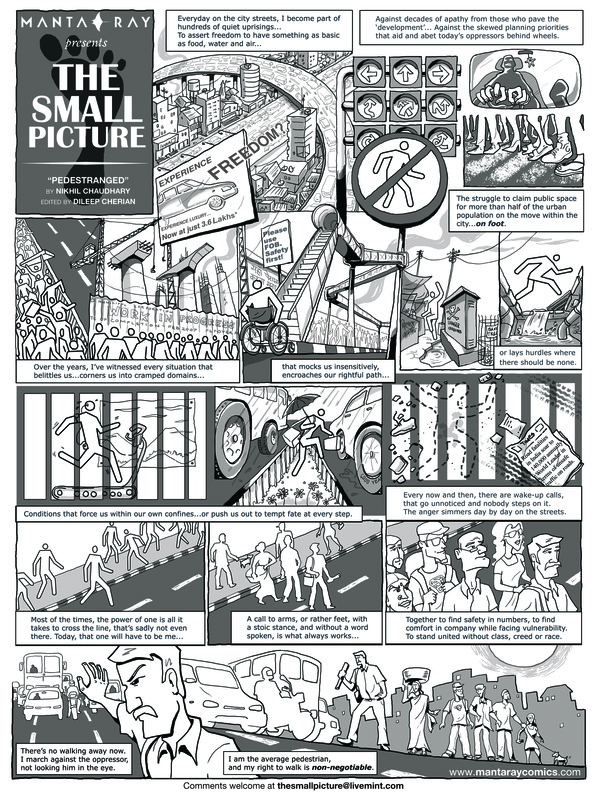 The middle panel shows the barricades being dangerously crossed with zooming traffic on both sides. Narrator: Conditions that force us within our own confines…or push us out to tempt fate at every step. Every now and then, there are wake-up calls, that go unnoticed and nobody steps on it. The anger simmers day by day on the streets. The sequence until this point is a flashback, setting the premise. The human figures are in the shape of that on a traffic-sign – A nameless – faceless – genderless entity as it is treated in the city-planning. Now, the narrative shifts to a present day situation of the narrator. The ‘uprising’ begins through the means of the narrator, and the figures slowly assume form, identity, and personality. The narrator is the first to step out on the road, later joined by others, until they bunch-up into a crowd. To find safety in numbers, to find comfort in company while facing vulnerability. To stand united without class, creed or race. The climax, a situation that any urban-dweller can relate to, pedestrians forcefully entering the vehicle lanes to cross. In Mumbai, they even gesture the drivers to STOP. Narrator: There’s no walking away now. I march against the oppressor, not looking him in the eye. The uprising succeeds, vehicles halt, people cross. The allegory here, is with the well-known monument in Delhi of Gandhi leading the historical Dandi march to perform the Salt-Satyagraha, (salt and the right to walk are both a common daily need) The figures are in exactly the same stance. Another day, another dawn! Narrator: I am the average pedestrian, and my right to walk is non-negotiable.